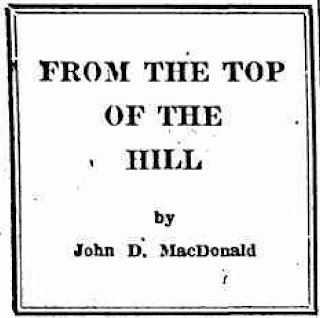 Another in the continuing series of newspaper columns John D MacDonald wrote for the Clinton [NY] Courier back in 1947-48, when the family were residents of that town. In addition to a nice Thanksgiving message (which I have posted before) there's a humorous recollections of John's days in military procurement, his Army job before he was called up to serve overseas in the war. The man he refers to, General Benny Meyers, was Major General Bennett E. Meyers, the number two man in procurement for the Air Force. during the war, and his name came up as part of a Senate investigation into the government's contract practices back then with none other than Howard Hughes. Supervising billions of dollars of contracts for planes and other equipment, "Benny" somehow managed to enrich himself far beyond the means of an ordinary government employee. It was revealed that during the war he was a frequent player of high stakes poker, enjoyed the amenities of many a fine hotel on contractors' dimes, burned through three wives (the third was an "actress" named Ila Rhodes) and owned stock in numerous private aviation companies, all who were awarded contracts during the war. And when he retired from his post in 1945 (earning a pension of $5.500 a year) Meyers purchased a luxurious mansion on Long Island at a cost of $60,000. In testimony he angrily denied any wrongdoing. 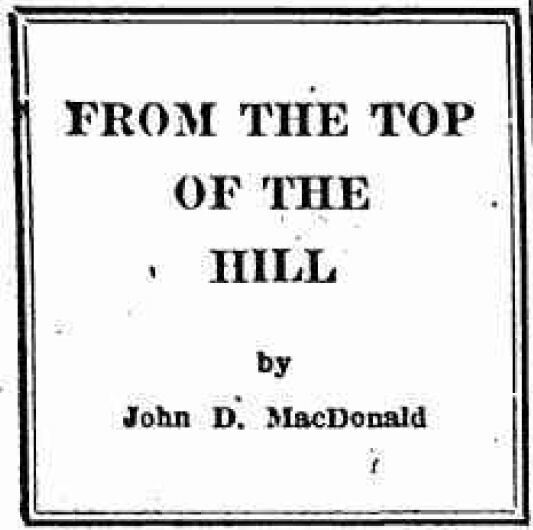 His initial appearance before the Senate committee took place two weeks before this column was published. Meyers may have been a partial role model for Colonel Dolson, a character in MacDonald's 1952 Collier's serial "My Brother's Widow", which later became the 1954 novel Area of Suspicion. Dolson was the on-site procurement officer at Dean Products, a company responsible for the production of top secret... well, if you haven't read the book yet perhaps I've already said too much. This year, Thanksgiving has given us an oddly uncomfortable feeling. It is a time when, nationally, we shake hands with ourselves in the pugilistic fashion, and consider our multitudinous blessings, with emphasis on the food department. This year, Thanksgiving is a time when two young American girls lost to their father a forfeit of twenty-five dollars each because they could not stand the official German food rationing system for two weeks. It is a time when American magazines will go overseas, and they will contain pictures of our healthy families gathered around the well-set table. Remember that Norman Rockwell picture of a family at dinner? It was drawn as a part of that series of four to illustrate the four freedoms. Reproductions of that picture go overseas. In many prisons where the convicts are permitted to read newspapers, someone goes over the papers first and cuts out any reference to crime. Maybe the United States periodicals that go over seas should have all reference to food removed. Did you ever open a magazine and look at a color photograph of a great big steak, butter melting on top? We wonder how those advertisements strike such persona as Bill Mauldin's French philosopher— the man who said that a pessimist cuts off the loose end of his belt, while the optimist merely punches new holes. Our ancestors gave thanks because they fought a wild and alien country with their hands and made the soil give them food. We give thanks because in this strange year of 1947, a blind throw of Fate's dice left us as an island in the midst of war, left us untouched by the hunger, cold and disease that afflict the rest of the world. We must be thankful, but not complacent. We are in the midst of the second armistice in the war that began in 1914. Somehow, during these years of uncertain peace, we must find the strength with which to protect this way of life which makes our Thanksgiving possible. Reading of General Benny Meyers' difficulties reminds us that it is only a question of time until an investigation committee comes boiling up here in black limousines and takes us back to Washington, probably handcuffed to a steering post. We have a guilty conscience. We were engaged in procurement activities for the War Department during the early war years, and one of our jobs was to help contractors get their tools and materials in ample time to meet contract schedules. One Christmas we got a card from a very good shoe company which said that a friend was going to give us a pair of slippers and would we please send along the size. We ran through the mental list of aunts, uncles, cousins, friends and decided that the donor was one of two relatives. We sent the size and a few days before Christmas the slippers came along with a card from the... Corporation. As they were made specifically for us, we kept them. But, before we could get accustomed to a wonderful world where slippers fell out of the blue, we were sent overseas. Otherwise we would probably have gone on from slippers to bigger things and would have ended up as sort of a General Meyers, junior grade. The slippers are still around and when the congressional thumb presses heavily on our doorbell, we will open the door with pallid face, shaking hands -- and the smell of burning leather in the house. We have received two letters suggesting that we lean more heavily on this matter of the fifteen cent charge on Utica phone calls. We found out the other evening that once upon a time a petition was prepared, signed and presented to the telephone company. Apparently nothing happened to alter the rate, but we have been unable to find out exactly what the official response was. At any rate, the opinion of the telephone company may have changed in the interim. To those persons who have taken an interest in this matter, it is suggested that they attend the next meeting of the Civic Group, ask Jim Sherman for the floor and move that a committee be formed to look up the response to the last petition and arrange for the preparation of a new petition if deemed advisable. The Civic Group is the local, non-partisan medium for getting things done -- and as such, should be the mouthpiece for all citizens interested in the betterment of Clinton as a place to live.